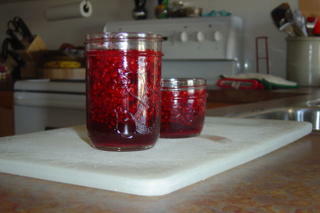 Add sugar to raspberries, stir and spoon into a jar. From "How to be a Domestic Goddess" by Nigella Lawson. On my recent vacation, I was lucky enough to come across Nigella Lawson's How To Be a Domestic Goddess for a low, low price. While flipping through it the other night, I read her recipe for jam. 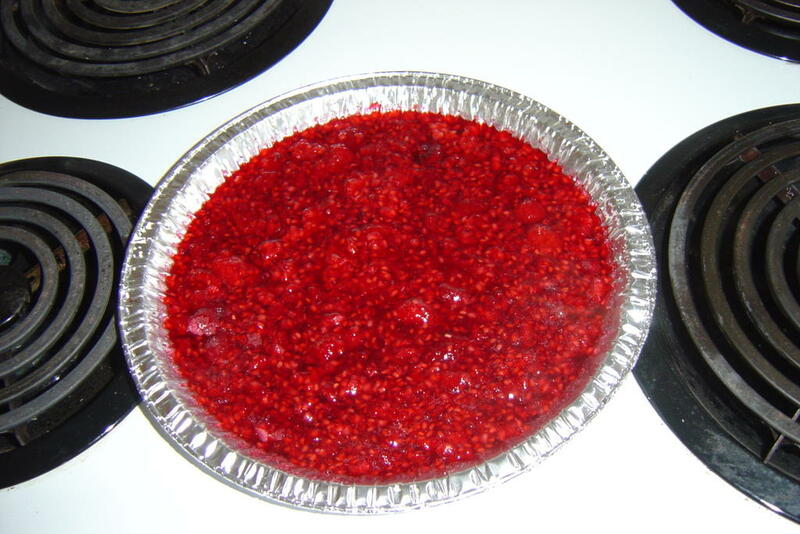 It is ridiculously simple - sugar and berries and no boiling- but is so good. 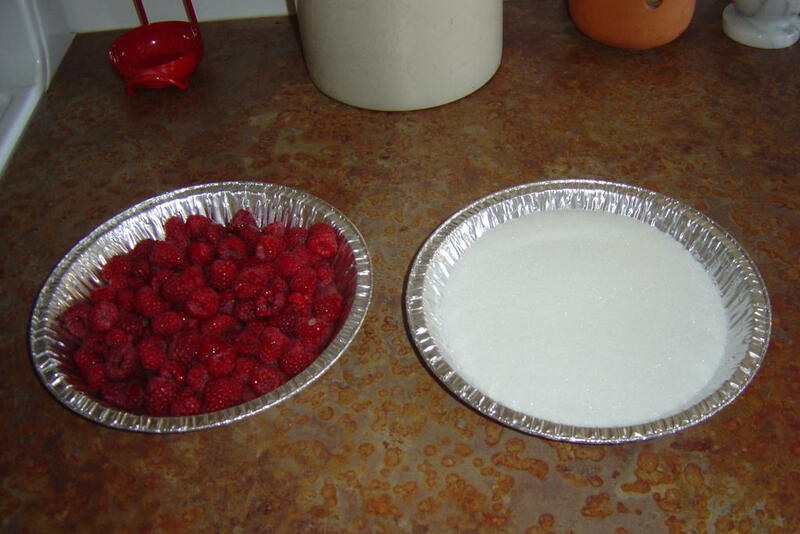 Equal parts sugar and raspberries. Into the oven they go! Out of the oven after 25 minutes. The house smelled so good. Everyone has at least one whether you want to admit it or not. To be honest, I can't think of a ton, I'm sure I've just blocked them out though. 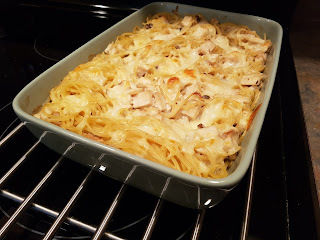 I remember trying a yogurt marinated chicken dish once that was thrown out after one bite. I remember making spring rolls for a friend and her boyfriend and accidentally using rice wrappers instead of wonton wrappers and having them explode in the oil. Lots of overcooking/undercooking things like hams, roasts and chicken. And of course I have subjected poor Scott to all kinds of recipes pulled from magazines, books and websites that weren't so great. A girl I knew told me a story about making a chicken dish to impress a boy, but the chicken was still raw (and cold!) when she served it. A friend of mine tried to make caramel bowls for a dessert for her boyfriends parents, but instead of making caramel from water and sugar, melted Kraft caramels and poured them over inverted bowls, and stood in the kitchen waiting for them to harden. But this is my most embarrassing food story. And really, it isn't even embarrassing to me! I had a boyfriend who lived with his parents, and I spent a lot of time there. One time I asked if I could make them dinner. It was summer, and where I lived had very hot summers. So I decided to do a light soup and a salad. I made a garden salad and a corn soup. I made the dinner, we all sat down, and took a spoonful of soup. To me it was GREAT. My boyfriend, who had had it before, liked it too. His parent's didn't. They took one bite and pushed it away. They would not even touch the salad. I was so embarrassed. All they did was complain - why would I make soup? Why would I have salad? Where was the meat? The bread? The soup was all vegetables, why was that? They got up from the table, and the mom said - We are going to A&W for hamburgers - do you two want to come? God, I was so offended. I NEVER cooked for them again. Even when their son and I moved to a different city together. When they came to visit, I made my boyfriend take care of the food. And believe me, he wasn't much better. Their eating habits were atrocious. One of his mothers special dinners was ground beef mixed with ketchup served over boiled potatos. White bread on the side. EW! Saute the onion in the margerine or butter until tender but not brown. Add the rest of the ingredients (I know there is no amount for corn, just put some in until it looks good to you) and simmer gently for 15 minutes. Now you tell me, who could turn their noses up at that?!?!?! That is a pretty messy cupboard. Things fall off the shelves all the time and you can never find what you are looking for. But no longer. All the candy and junk food (or most of it) is gone. 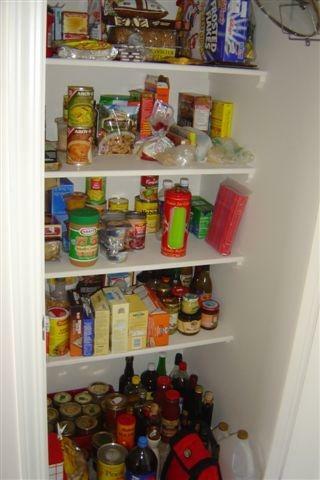 Also gone, all the expired food, the packages that have been opened and sitting around for ages, and the stuff I just knew we'd never eat. 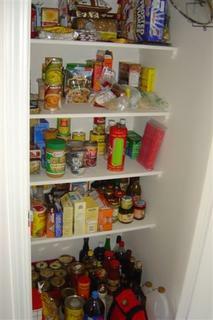 I get a clean pantry where no one will be injured by falling food, and the food bank gets 2 boxes of food. 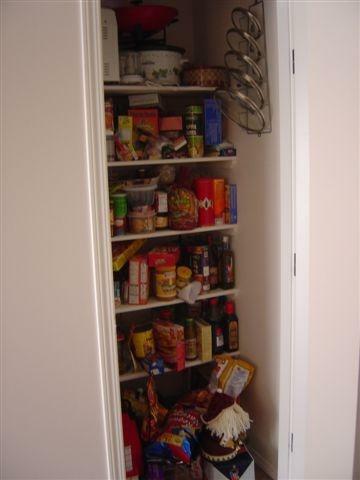 Next up - THE DREADED SPICE CUPBOARD! PS - How did we accumulate so many bottles of olive oil and also balsamic vinegar? I think there must not be any left in Calgary. Beer Can Chicken Spring 2004. 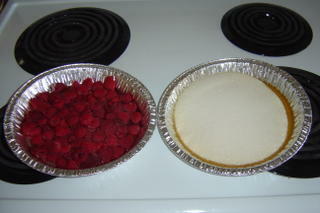 Here is a similar recipe by The Surreal Gourmet. 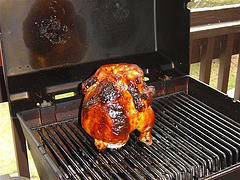 Ours - we made our own rub (brown sugar, salt, crushed dried chiles, etc), rubbed the chicken inside and out, slathered with bbq sauce, sat it on a 3/4 full open beer can, and cooked on the bbq, over indirect heat rotating every 15 or 20 minutes for 1 to 1 1/2 hours. Thank you to Ana for tagging me for my first meme. When I was about 6 or 7, my cousins came from England to visit. My male cousin who was a year or two older than me and I decided to make breakfast one morning. We found a recipe for pancakes in my Disneyland cookbook (I miss that cookbook) and made them. Unfortunately we did not read the recipe all the way through. The recipe called for 10 TB of butter to cook the pancakes in. You were supposed to melt 1 TB, cook some pancakes, and then melt another TB, etc. We melted the whole amount of butter and basically deep fried the pancakes. They were gross. My mom did, and then when I discovered cooking shows on PBS, it was Julia Child and the Frugal Gourmet. Do you have an old photo as "evidence" of an early exposure to the culinary world? Does a picture of me covered in chocolate pudding count? Turkey, because it is something you normally make on special occasions for lots of people. I am always terrified I will undercook it and that I won't notice until we are sitting at the table eating. What are your most valued or used kitchen gadgets and/or what was the biggest letdown? My most valued is probably my Kitchen Aid mixer. I don't use it as much as I thought I would, but it is just so pretty. Most used is probably my tongs and my food processor. I just recently got my processor, and it is surprising just how many uses it has. Most disappointing - my waffle maker. I have had it for years and very rarely does it work as a fairly expensive waffle iron should. Name some funny or weird food combinations/dishes you really like - and probably no one else does. This is tough. I like bread with butter and HP sauce. I like teriaki sauce on baked potatos. I like ham sandwiches with potatos chips inside. When I was little, I liked to eat gristle, but thankfully I've outgrown that. What are three edibles or dishes your simply don't want to live without? Vanilla Bean with cherries from Marble Slab. That was fun! Even though this was sent to me 2 weeks ago (I went on holiday), I will tag Emily at Baking Beast to see if she is still around. Jennifer at Taste Everything Once because her site is so great. I'm sure Kitchen Hand at What I Cooked Last Night is too busy being a new dad, but you never know.